Home//What Can You Do With Your Floorplan? 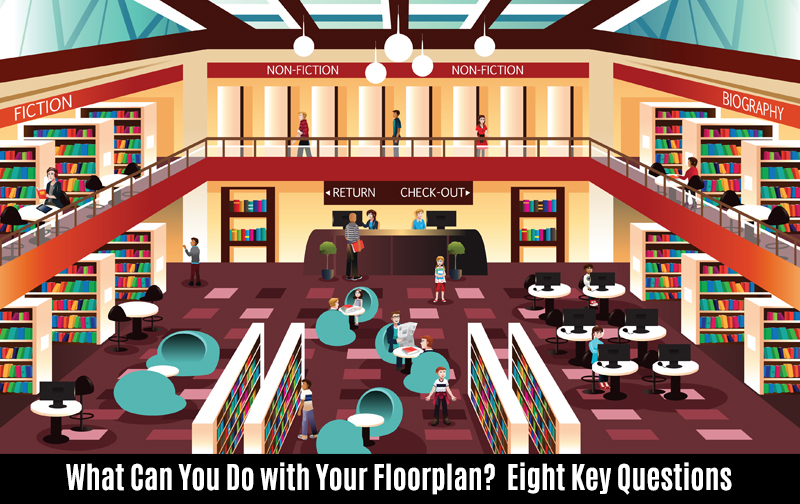 What Can You Do With Your Floorplan? At one time, patrons had to visit the library in order to read or borrow. The physical space was paramount. To remain relevant, we librarians have been preaching for decades about how our libraries are so much more than brick and mortar buildings with books inside. So we welcomed the digital revolution. But thanks to our web and social media presence, 24/7 access to e-resources, online application for library cards, and the ability to request and renew materials without ever leaving home, some library users rarely set foot inside the library. And when they do, their time spent there is extremely brief. Now we've come full circle and we’re advised to focus on the library as a destination. Many of today's patrons enter our buildings regularly and stay for extended periods. They are the program attendees, the newspaper and magazine readers, storytime moms and dads, the afterschool crowd. We create spaces that entice new users and encourage our patrons to visit and visit often. Once again, the walls of our buildings, shelves that hold our physical collections, and the overall library layout mean a lot. And we want it all: quiet reading and study space, group meeting /collaborative space, programming space, makerspace, public access computer space, and information service space. Not to mention the workspace your staff needs to do their jobs, plus the space needed to store and access tens of thousands of books, DVDs, audio materials, and periodicals. So barring major renovations and building projects, what can you do to maximize your floorplan and work within your constraints? Here are some ideas. Observe how people currently use your library. Is your existing layout working with or against its day-to-day usage? Think about your collections and spaces and their intended purposes. Are those purposes still valid? Many buildings were designed with a focus on collections rather than people, and certain collections were given priority. Note how those priorities may have changed, and consider what you can do to help your layout keep pace with changing usage patterns. Are there large gaps in some collection areas and no room to shelve materials in others? Usage reports can be liberating. Are your collections earning their keep? Think about where you can deaccession and compress, transferring excess linear footage to areas that need to grow. If you find yourself with long weeding lists for juvenile nonfiction, yet struggle to find anything to withdraw from easy readers, then it’s time to devote more space to the areas that truly need it. What’s collecting dust or hasn’t been kept up-to-date? What can you eliminate? For example, if local history and genealogy aren't faring particularly well with your patrons, consider not doing them at all. Is there another branch in your library system or another agency in the community, such as a historical society, that can do it justice? If so, forge a partnership and ship your vertical files, map cases, and atlas stands there. In short, give yourself permission to let things go when it makes sense to do so — the collections that were once viable but no longer are; or collections that were experiments and failed to take off. Are there any underutilized staff spaces or meeting rooms that can be turned into collection rooms or opened to the public? A lot of libraries eliminate the top and/or bottom shelves to make browsing more user-friendly. Another option is to intersperse signage, displays, or artwork in the stacks. Take advantage of “spaces between spaces” to create interest. Use slatwall and end of range shelving. If you’ve accumulated enough empty shelves, perhaps you can remove entire shelving units to create more people space. Is your furniture comfortable and functional? Do you typically have just one person sitting at a large table that is designed to accommodate many? Try café counter-type seating. People often don’t mind sitting in close proximity to others when they are seated side-by-side rather than face-to-face. Are patrons constantly moving tables and chairs? If so, is it to create collaborative areas, or to be closer to windows and outlets? Trade your bulky library tables for two-person tables that can stand alone for quiet study or be pushed together for group collaboration. Do you have to turn people away from popular programs because of inadequate space? Try staggering hands-on programs by scheduling them at half-hour intervals. If your library is too loud for those wanting quiet, consider designating regular quiet times and plan your programming accordingly. Makerspaces don’t have to be spaces at all. You can buy or create your own maker carts, tinker tables, and sensory bins. Can you move programs outdoors or create outdoor spaces? How can you make some minor, low-cost changes? If there’s no room in your facilities budgets, try friend groups, local grants, and endowments. Eagle Scouts are often looking for projects, which may be underwritten by their organization and local business. Free labor can come in the form of high schoolers ‘ community service projects or other volunteer groups. Local colleges may also be able to offer free design assistance as part of coursework. Whatever your problems – running out of room for collections, inadequate people space, insufficient programming areas, lack of an open, welcoming feel in your library – there are ways to work within the confines of the physical space you’ve been given and maximize your library's potential.